Welcome to Kids College, a summer program offered by the Division of Community Education at Walters State Community College. Kids College is a summer enrichment program for students completing the second through eighth grades. The Division of Community Educations goal is to educate, entertain and broaden your child's horizons with unique learning opportunities on a college campus. Classes offered include Crime Scene Investigation, Robot Wars, Pottery, Acting, Marine Biology, I-Pad Experience and much much more. 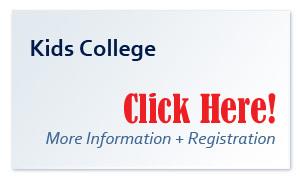 Kids College is offered during the month of June. Registration and information will be available in April.